Webster Hall’s doors are closed for renovations indefinitely, ending a century of music history in the East Village. It’s the end of an era for Webster Hall, the iconic East Village venue located conveniently across the street from NYU’s Third North Residence Hall. 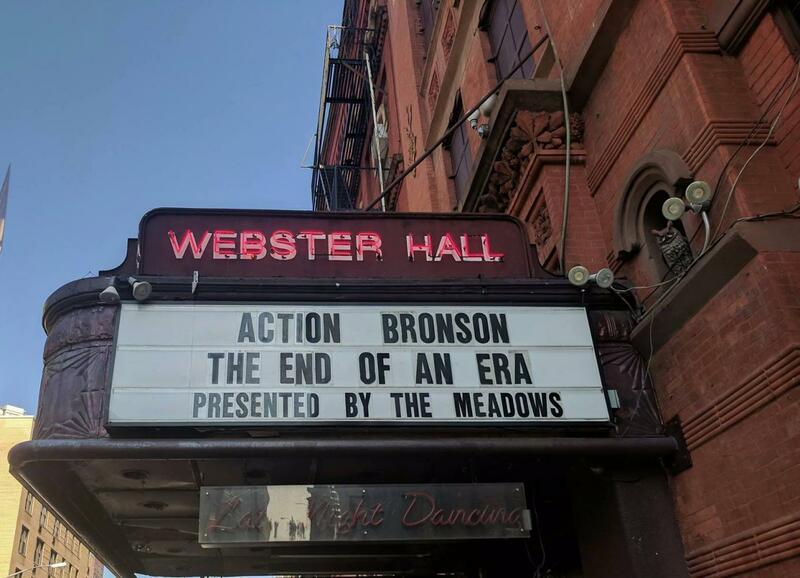 The venue had its last show on Aug. 10, where Action Bronson performed to a sold-out crowd. The building itself has been around for more than 100 years, although it has existed as Webster Hall since 1992. The storied venue has seen a host of famous shows from the likes of Travis Scott, Skepta and of course, the Kanye West make-up show that never was. Before that, the stage featured countless legendary artists like Elvis Presley, Bob Dylan and the Beastie Boys, among others. The venue will be shut down for an indefinite amount of time for renovations. Brooklyn Sports and Entertainment and AEG Presents purchased the space in a joint venture. AEG launched the Panorama Festival in 2016 and also runs locations like the Barclays Center and Terminal 5. Reports indicate that the venue will become more concert-centric with fewer club nights. The shuttering of the hall is no doubt a sad reality for many at NYU. The venue has been host to countless memories for NYU students and will be sorely missed. The venue’s weekly line of concertgoers dependably wrapping around the block was an integral part of many students’ late night commutes back to their residence halls. However, there is hope for the shuttered venue. As Billboard reports, AEG plans to spend $10 million renovating the space. Brett Yorkmark, CEO of Brooklyn Sports and Entertainment, envisions the revamped venue as a feeder location for up and coming talent hoping to one day play shows at bigger locations in the area. Yormark also told The New York Post that the new ownership seeks to “preserve what Webster Hall means to consumers and artists,” but modernize it. This will likely come in the form of food, beverage and even bathroom upgrades. With this in mind, the seemingly grim news of Webster’s closure also marks promise of a new beginning. AEG Presents is extremely well-seasoned in the realm of venue management and promotion, and a more artist-centric lineup may in fact prove to be preferable to event-goers who were previously uninterested in Webster’s club nights and special events. Regardless of the potential benefits of the renovation, the fact remains that New York concert-goers will have to say goodbye to Webster Hall and all of its grungy glory. The closure of the independently-run hall is no surprise, given the ever-gentrifying nature of New York City real-estate. As New York becomes more expensive, independent ventures are frequently being sold and replaced with more profit-oriented corporate entities. From CBGB’s closing to Palladium becoming an NYU residence hall, Webster Hall’s passing is just another mark of an ever-changing city. Webster’s closure is far from the exception and change is and always has been the rule in this city. The hall’s renovated successor might have better bathrooms, but nothing will be able to replicate the charm and character of the venue people came to know and love.